In his Friday Sermon of March 23, 2012 Khalifatullah Hadhrat Munir Ahmad Azim Sahib (atba) of Mauritius paid glowing tributes to the staggering literary contributions and special spiritual achievements of the Promised Massih Hadhrat Mirza Ghulam Ahmad (as) of Qadian. The sermon succinctly summarises the extraordinary efforts of the Promised Massih (as) to defend and espouse the cause of Sahih Al Islam by wielding the pen as the sword of Allah. 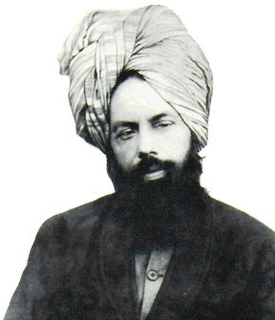 “… Hazrat Mirza Ghulam Ahmad, the Promised Messiah and Mahdi was born to a noble family in Qadian, India. From an early age he had a keen interest in religion and used to devote the majority of his time in reading books and staying in the Mosque because of his love for Allah. He was also known for his honesty, friendliness and resolve. Over time by the grace of Allah his knowledge and understanding of religion and its application to society deepened. Being a Muslim it was his firm belief that all religions were true at origin and he always sought to uphold the dignity of religion and to demonstrate its relevance to everyone. His earnest defence of religion was ultimately blessed when he started to receive direct revelation from Allah – a blessing that he received for the rest of his life. His mission was to revitalise the truth that all religions held within them and to revive the teachings of Islam. It was through this that he would bring mankind together and establish everlasting peace. In 1889, under Divine Guidance, Hazrat Mirza Ghulam Ahmad (upon him be peace) founded the Ahmadiyya Muslim Community, a community which had grown in stature and strength and conveyed the message of Islam to the ends of the earth. But today, after having reached its peak, it (this community/Jamaat) has lost its credence and essence as true all because of some rebels (creators of chaos) found therein who have trampled the teachings of Islam under their feet. But Allah remained true to His promise which He made to His Messiah and He sent another Messiah to hold fast the torch of True Islam which Hazrat Mirza Ghulam Ahmad (upon him be peace) came to revive in his era. As a religion and spiritual order, Islam offers comprehensive ethical and moral guidance on all aspects of life in its varied facets. And a Muslim will be able to find solutions within the framework of the teachings of Islam to the many problems he or she is confronted with. This can be done even without injecting ideas and processes antithetical to the Islamic perspective (Bid’ah) by seeking to equip oneself with the correct knowledge of Islam. Apart from practicing Sahih Al Islam, a Muslim ought to share the richness of the Islamic path- “beauty, rationality, practicality and completeness”- and its innate ability to appeal to the human mind with all of mankind. In his Friday Sermon of March 09, 2012 Khalifatullah Hadhrat Munir Ahmad Azim Sahib (atba) of Mauritius gave a discourse on how to conduct the preaching of Islam and underscored certain points to keep in mind in Dawa. (2) Inviting people with Hikma (wisdom) and beautiful preaching. Prophets and other Messengers are raised by Allah, the Most High. He bestows His favour on whomsoever He wills among His servants and such persons declare a Divine Mission when the Divine Grace descends on them. And Allah knows best when and where to place His Message (6: 125). The Holy Qur’an declares: ‘He cannot be questioned as to what He does’, but those who reject the Messengers will be questioned as to what they did (21:21). About the Divine Messengers, Allah states in the Holy Qur’an: “We sent none as Messengers before you but men to whom We sent revelations. So ask those who are well versed in scriptures, if you know not. And We did not give them bodies that ate no food, nor where they to live forever” (21:8-9). No wonder, Divine Messengers invariably affirm their humanity. The Holy Qur’an repeatedly mentions this fact: “We are indeed only men like yourselves, but Allah bestows His favour on whomsoever He wills from among His servants” (14:12). About his status and mission, a Messenger declares: “I am only a man like yourselves; but I have received the revelation that your God is only One God. So let him who hopes to meet his Lord do good deeds, and let him join no one in the worship of his Lord” (18:111). Hence, the profound duty and responsibility of a Messenger of Allah is to make people understand the real purpose of life and to guide them in leading a life of meaning and enduring value, both in this world and the world to come. Their life as lived in this very earth is the message for their fellow beings. In this way, the Messengers essentially seek to purify people and to guide them to their Lord through their noble precepts and credible practices. To know the prophets and the Divine messengers is to know the ways of Allah. The life of Hadhrat Mirza Ghulam Ahmad (as) of Qadian is a recent testimonial to the enduring principles of Divine Mercy and continuity of revelations confirmed by the Holy Qur’an. Understanding the physical and material circumstances of his times, family background, early education, traits of character and spiritual inclination from early life are important in a way for the believers to marvel at the contingent circumstances against which Divine Messages emerge and thrive. In a world that refuses to recognize the spiritual reality of a Living and Ever- Subsisting Lord who speaks to His servants and answers the prayers of His supplicants, what better way to affirm those principles than to remember the lived history of such Divine Messengers? In his Friday Sermon of March 16, 2012, Khalifatullah Hadhrat Munir Ahmad Azim Sahib (atba) of Mauritius sketched a fascinating glimpse into the early life and times of Hadhrat Massih Maoud (as). The first part of the Sermon was published here at the Sahih Al Islam Blog on March 17, 2012. In his Friday Sermon of March 16, 2012 Khalifatullah Hadhrat Munir Ahmad Azim Sahib (atba) of Mauritius spoke about the Promised Massih Hadhrat Mirza Ghulam Ahmad (as). The speech graphically portrayed a picture of Hadhrat Ahmad as a young man and also that of Qadian, birthplace of the Promised Massih (as). The growing up years of the man who would eventually be raised with a Divine Mission, as emerging from this Biographical note, makes one really appreciate the Divine Plan behind it all. "When Massih Ma’ud (upon him be peace) was born in India there was no schools or colleges. Education in Muslim households consisted of learning the Holy Quran and, at the best, learning to read Urdu and Persian. The first tutor of Hazrat Massih Ma’ud (upon him be peace) was engaged when he was about six or seven, around 1841. He taught Massih Ma’ud (upon him be peace) verses of the Quran and started on a few elementary Persian books. When he was about 10 years old, another tutor was engaged. He worked hard with Hazrat Massih Ma’ud (upon him be peace) and taught him the elements of Arabic. A few other boys came to his house to share the services of the tutors. One tutor was often teased. It is not known whether Hazrat Massih Ma’ud (upon him be peace) joined in, but it is unlikely. He was a serious, studious boy and when the day’s lessons were done, they were held in what was a living room, he normally climbed the stairs to his room, which was immediately above and continued reading. In October 2010, an Ahmadi seeker of truth from Kerala, India wrote a letter to Hadhrat Munir Ahmad Azim Sahib of Mauritius (atba). While seeking information about the exact nature of the claim of Hadhrat Sahib, he expressed his conviction: "[i]t is incumbent upon me as a Muslim to accept the divinely appointed Khalifatullah of the Age". Hadhrat Sahib’s considered response to the letter throws profound light on the concept of Tawheed and the continuity of Divine revelations in Islam and a brief account about the divine bounties bestowed on him in recent times by Allah the Most High. “….By the immense grace of Allah, He has recently officially (10 September 2010) raised me in addition to being an Amir'ul Momeneen, Muhyi-ud-Din and Khalifatullah to the honourable position of Mujaddid and Massih Maoud of this age. I have come to revive the teachings of Islam, the teachings of the Holy Quran and to guide the whole humanity towards the worship of one God, Allah (Tabaarak Wa Ta'ala).